Twenty-first-century voiceover recording has evolved. 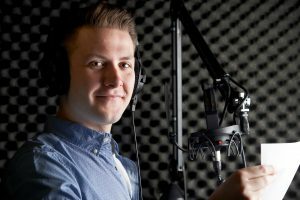 Previously a voiceover artist, filmmaker and end client (amongst others) would gather together in a recording studio to record a voice track to a film, corporate video or audiobook. In recent years, technology has altered the process. Now, the whole thing can happen remotely and in a fraction of the time. However, this has impacted accepted etiquette, so how can you make sure you’re sticking to the rules? Essentially, remote processes make everything more accessible and flexible and this is true of voice recording. Without the need for physical presence, the obstacle of diary organisation is removed. However, what has replaced this is a requirement of heightened honesty and consideration. For artists, remote recording can lead to the temptation to stop considering your appearance. Try not to! Dress the part and it will be reflected in your voice. Particularly key is the issue of illness. You wouldn’t turn up to a studio sniffling and coughing, so you should extend the same courtesy for remote recordings. Be honest if you are experiencing anything that will affect the sound of your recording. Within a studio, a good sound engineer is invaluable. Their knowledge and experience should never be overlooked or ignored. Within a remote environment, they don’t necessarily play a part as the artist downloads a completed track from their studio set up. Therefore, everyone needs to be a bit of an engineer now – post production engineering is now much more advanced and more radical changes can be made. 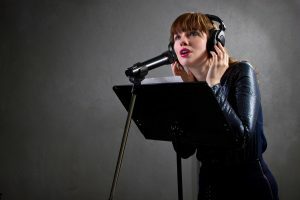 In this way, it is important for clients and artists to conduct their recording session in a way that is sympathetic to those who may be manipulating the voice files after the session has taken place. Be that yourself or another colleague or associate. 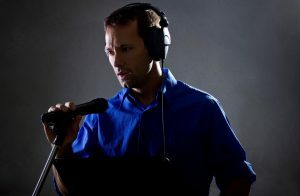 While a section of voice track is being recorded, there is no need for eye contact, indeed many artists avoid it in order to retain an optimum position with the mic. In this regard, remote recording has made little difference. However, face to face contact in the studio would enable director, client and artist to gauge how a session is going. Since this is missing in a remote recording, it is important to be clear and honest when dialling in to a voiceover session. Tread the line carefully, it is always best to remain on good terms with associates so be honest without being rude! This is relevant whether you are meeting in a studio or dialling in to a remote recording session. Everyone’s time is at a premium these days – advances such as remote recording haven’t released time but simply enabled professionals to fit more in! So be respectful to those you are working with and don’t leave them hanging on the line. For artists, prompt return of the finished track will set you apart from the competition and encourage repeat business. When you record in a studio, you are expected to go incommunicado from the outside world. This stands true for remote recording sessions too. In a world where we expect to multi task and remain accessible at all times, this can feel alien. However it is vital, whatever your role in the remote recording session, for your attention to be entirely at the job in hand. Artists should not have a mobile phone disrupting the track. Clients should not be attempting to answer emails on the side. It is true that technology has changed the manner in which we can approach voice recording. On the whole it has improved and eased the process. So really, the key in achieving the best recording for directors, clients and artists is to be a bit old fashioned as far as etiquette goes. All parties should treat the session with the respect that would be demanded if they were physically present in the session. You may be planning a corporate video for any one of several reasons. Perhaps it is for sales, training, recruitment or B2B marketing. In order to achieve the results that you seek, the tone of your finished piece must be on point. You will set the tone through both visual and audio aspects of the work. Get it wrong and you alienate your audience. Get it right and you impact your audience. This could be through entertainment, emotion or empowerment. To identify the tone that is right for your business, first think about who’s watching. Aspects like age profile, professional status and the relationship that they hold to the business. Is the video aimed towards internal colleagues or external associates? Depending on the profile that is built, you should choose a visual and vocal style to match. It’s important that the two styles complement each other too. So if you choose a whiteboard based graphic style, this should be maintained with an upbeat voiceover. Next, consider what you wish to achieve by the corporate video. Corporate films should be short and dynamic with one or two clear messages. You can achieve an energetic tone with fast moving images or vibrant graphics. However, get the voice wrong and the content of your video is meaningless. If your video is targeted with a training or informative purpose, it is vital that the correct information is conveyed. It is easy for an audience’s attention to drift so you need to be meticulously structured when scriptwriting for your voiceover. As a corporation, it is likely that your brand will be present in your video. Visually, this may come with the inclusion of a logo. Brand awareness is more than a logo, though. You must be clear about your corporate identity and business mission prior to the creation of your video. In this way, your brand can be represented by the tone of your video. You could visually link aspects of a video within a branded colour scheme. More often than not, though, a voiceover will be pivotal in establishing accurate branding within a tone. Using a familiar sounding voice is a great way to build brand confidence. This doesn’t necessarily mean a celebrity voice; simply one that is warm and open. The attention of your audience must be grabbed within the first nine seconds of a video. It doesn’t matter if they are a captive audience stuck in a boardroom; if their brains aren’t engaged they may as well not be watching in the first place. So make an impact. This could be through humorous or poignant content. Don’t include too much information in those opening seconds; it is simply attention that needs to be gained at this point. Choose a voice that your audience will want to listen to. Link your elements with a story that your audience will want to follow. It is often vital for corporate videos to include technical jargon. However, don’t assume that your audience will understand it all from the outset. Include explanatory passages within your voice script. In some instances beware not to let your search for familiarity damage a tone of authority. This is especially true for training; attempt to be too familiar, and you again risk alienation. It’s straightforward to look towards humour or emotion to establish a connection, but the implementation is so easily done wrong. This is where research is key. Taking the time to identify potential stories that carry a link to your organisation will make them more relevant. Perhaps there initiatives within your Social Responsibility programme that will resonate. Humour is notoriously hard to get right, so if you choose this path keep it brief and punchy. Identifying a voice with the perfect tone for your project is only part of the story. To enable that voice artist to achieve an audio recording that meets your expectations, you must provide them with a great script. By putting in the extra effort when structuring your script, you will be able to get the best from your voice artist. But what makes a script great? Essentially, clarity and concision. Fine tuning a script takes time. However, remember that this is the time that you will save when you’re paying by the hour for your voice artist’s talents! A great script begins before any words are put together. Take the time to discuss and brainstorm what your key points are. Be ruthless and remove any messages that overlap and duplicate other points. Whether your project is a corporate video or commercial advert, it is easy to become enthused with your business message. Try to limit the points that you are aiming to convey. It will mean that those messages that form the focus of your script are clearly represented. Once your key message is identified, find ways to express it briefly and concisely. Remember that your audience has a finite amount of attention. This is one thing that all audiences have in common! You can keep listeners engaged by varying the tone and pace of sentences. Avoid delving too deeply into your topic with industry jargon and slang. This is more likely to alienate than engage. There are potential stumbling blocks that sneak under the radar of most scripts. Look out for dates, acronyms and URLs. You should detail the exact way that you wish a date to be spoken. So: ‘fifth of June twenty eighteen’. Any acronyms should be fully detailed in the first instance and you should be clear to the voice artist whether they should say individual letters or pronounce it as a word. Don’t include the www prefix when referring to URLs. It is extremely clunky when spoken and is unnecessary for an audience’s comprehension. Throughout your script writing process, read the words aloud. What appears clear to the eye may not be so to the ear. So if you stumble over some sections, it is likely that your voice artist may do the same. Even better than checking your script by reading aloud is to read it aloud TO someone who has not been working on the script. Any sections which were unclear on first listen or are repetitive should be revisited and altered. For corporate projects, you may have several departments who will feedback and approve the script. So the text document may accumulate various thoughts and notes. For your final script, delete anything that you do not want to be spoken aloud. Keep any directorial notes completely separate to the voiceover script to avoid confusion. If you do not intend to dial into the recording of your voiceover this is even more vital. To achieve the best possible voiceover product, it is important to remain flexible. This is why it is advisable for you to dial into the recording of your script. Communication with your voice artist is imperative. Remember that these are experienced professionals so if they have any comments or suggestions, be collaborative. You’re more likely to get a voiceover that ticks all the boxes and avoid the need to re-record. As important as words, pauses and short silences allow an audience to process the information that you wish to convey. Indicate pauses inside brackets, so: [pause]. If your project includes vibrant visual elements, consider how the use of pauses can complement the visual stimulation on display. 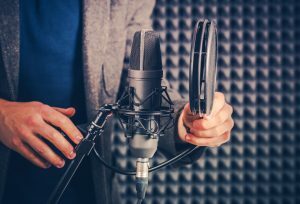 The voiceover world, as with a lot of industries has undergone a huge transformation over the last decade. Gone are the days where every voiceover involved a visit to a swanky Soho studio and boozy lunch afterwards. For the most part, those jobs have largely disappeared. That’s not to say that the voiceover has disappeared. In fact far from it. In this age of 24 hour contact-ability and instant information, the voiceover is more relevant than ever. Any website worth its salt will have a video nowadays and that video more than likely will have a voiceover. so the same can be said for your narration. A good voiceover can rescue a lack lustre video but conversely, a poor one can ruin an otherwise good piece of content. So there are far more voiceovers happening a year than ever before but the landscape has changed dramatically. 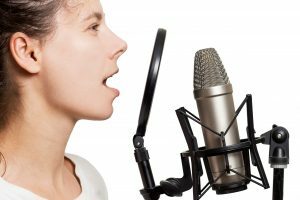 For this reason, the modern voiceover artist needs a different set of skills. No longer do they regale the client with stories of their showbiz pals, now they need to be efficient and provide value for money. That is because in today’s world most busy voiceover artists work from their own studio and that means they need to understand how to use it. It’s why when artists apply to be on our sites we look for three very important qualities, the sacred trinity of the modern artist. As has always been the case, they must have an exceptional voice. Although trends have changed and regional accents are far more in vogue than 30 years ago, the basics of having a pleasing timbre haven’t. What has changed however is, very often now, there isn’t the budget for a director. That means clients rely on the experience of the artist to get the best out of a script and often that experience and input include script editing. So a quality which we ask for in our artists is the experience and ability to instinctively interpret a script. This is something that happens naturally after years in the industry and essential if clients are to get value for money in these budget conscience times. Finally because all our artists work from their own studios, it is essential they understand them and know how to use them. This is something artists of the past never had to worry about. There was a chap who switched the switches and moved the faders, now it’s all part of the same job. That’s why the voice artist of 2018 is a very different animal and from a client’s perspective, I don’t think that’s a bad thing. Not that long ago, actors and vocal artists would, as standard, work incredibly hard to lose their regional accent. The scope for diversity within voice over was extremely limited, with anything beyond RP (received pronunciation) frowned upon. This is a reflection of the class assumptions of the time and is now outdated and unnecessary. In fact, many clients who require a voice now seek specific regional accents to reinforce their brand through audio. Britain is a melting pot of accents, tones and dialects, all of which inspire different associations in different audiences. Of course, an audience is a transient thing and must be considered and profiled to the same extent as the voice that you choose to represent your brand. What tone and accent will be most appealing to your audience? Appealing to consumers is clearly a variable business. Brands seek to gain the trust of social profiles from different backgrounds, different regions and different age brackets. Obviously what appeals to one may not appeal to the other. Which is why many high profile brands spend a great deal of research time and money in discovering what voices are most effective for them. As a general rule, northern British voices are perceived as more trustworthy. Many advertisers look further beyond this to choose a celebrity or familiar sounding voices to further suggest trustworthiness. In contrast, many areas of the UK respond more positively to advisory information when it is transmitted through Home Counties or RP voices. For this reason, many instructive uses of audio such as those advising tax deadlines or the digital switchover have employed an authoritative RP voice range. Conversely, residents of some regions prefer to listen to lifestyle direction such as warnings against drink driving, smoking or faulty smoke alarms when they are spoken in the local vernacular. Narrative voices in projects such as audio books are often directed by the story genre. Where menace can sound especially effective through a Glaswegian accent, romance can be conveyed to wonderful effect through melodic Welsh. Alternatively, storytelling that is area specific can be chosen based simply upon geography. A tale set in Birmingham, for example, can better conjure its fictional world with a voice appropriate to that geographical area. Sometimes geography is intrinsic to an organisation. So when corporate projects such as whiteboard instructional videos seek a voice, it may be imperative that the local business area is reflected. Newcastle accents are often associated with warmth and understanding, so are often chosen for customer service focussed projects. However, if your corporate brand is global (or aspires to be so), then it’s best not to go too niche. Mid-range American or Home Counties British tends to strike the balance well here. Of course, this segues into both advertising and corporate activity. Designing a video which is intended to advertise through social media relies upon its scope to go viral. For this reason, it needs a great voice. Distinction is the key here. So familiar and characterful accents are a great place to start. Think Liverpudlian or West Country. Both of these accents, although geographically miles apart, are attention grabbing whilst maintaining a relatable familiarity. Very specifically instructive, training audio requires accents with clarity and authority. Where RP is a great accent to achieve this, it can sometimes be perceived as bland and in this way struggle to demand the attention that training requires. Many training projects choose the North Western Mancunian to achieve a more textured educational audio. Whilst every project is entirely unique to its individual aims and targets, thinking about accents is a great way to narrow down a pool of voices. Regional dialect is such an inherently ingrained aspect of British society that choosing the right vocal accent for your audio project is arguably the point that will lift it beyond the ordinary.